A2X for Shopify is in limited preview. If you have been invited to preview A2X for Shopify, this article will guide you through getting set up. 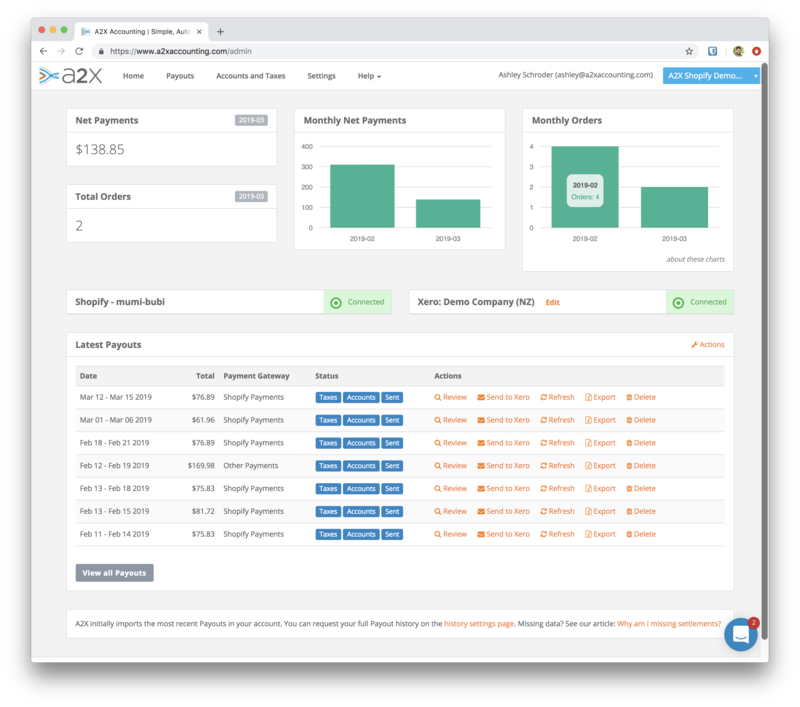 A2X for Shopify imports your Shopify payouts and sales, and posts them to your accounting system in a way that makes it easy to reconcile the sales, refunds, discounts taxes and shipping against the cash receipts. Scales to support 1000's of daily orders without sending 1000's of individual invoices to the accounting system. Supports multiple Shopify stores connecting to a single accounting system for multi-channel sellers. Access to the service is by invitation - A2X partner accounting and bookkeeping firms have early access. Shopify Payments payouts will reconcile to their corresponding deposits. Other payment gateways (such as PayPal, Amazon Pay) will use a clearing account to reconcile. Multi-currency support is currently in preview, and only available on the Advanced plan - if you have Multi-currency requirements please contact us to discuss. If you have been invited to access A2X for Shopify you'll have a link to create a new A2X for Shopify account (if you're not sure please get in touch with us). Use the link you have to create your account. If you already have an existing A2X for Amazon account, you will be asked to confirm you wish to create a new account. Now you are ready to set up your new A2X for Shopify account. You will be redirected to your Shopify store and asked to login and grant A2X permission to connect to your Shopify store. You must grant this permission in order to use A2X for Shopify. Once the permission is granted you'll be redirected back to A2X and your first payouts will begin to import into A2X - this process usually takes 10-20 minutes to begin populating in your account and for larger Shopify stores can take several hours to complete. Click the Connect button for your accounting system and proceed with the connection process. You will be redirected to your accounting system to grant A2X permission. If you are connecting A2X for Shopify to the same accounting system that you are already connected to with a different A2X account (Amazon or a different Shopify store), you should choose to use the existing connection, rather than create a new connection. You need to configure A2X for Shopify to map your Shopify transactions into your accounting system. 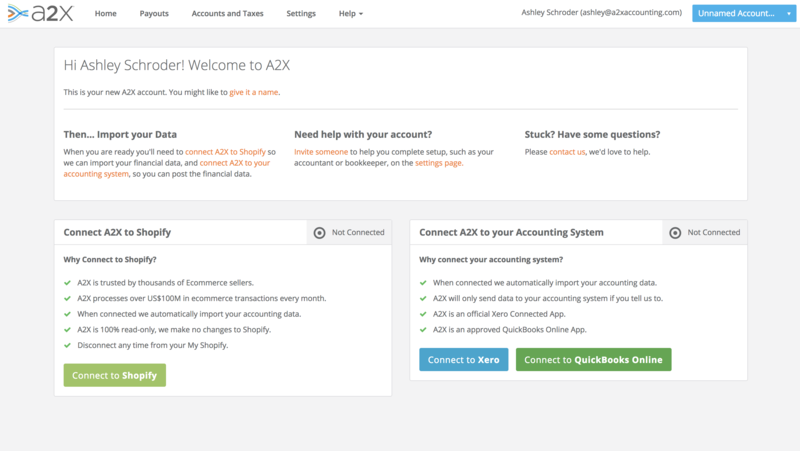 A2X will offer to create several generic default accounts, or you can select your own individual mappings. We recommend working with your accountant on this initial setup as it will impact how the Shopify transactions appear in your financial reporting. You can also customize how the A2X transactions are created, such as grouping the sales by country or province in the Settings > Invoice settings section of A2X. This can help if you have specific tax handling requirements for some countries. The sales, refunds and other transactions that are paid via Shopify Payments will be imported to A2X in their own payouts, these will be posted as a single batch of transactions and will always match perfectly to the corresponding deposits from Shopify. If you use other gateways or payment methods on your Shopify store, these will be imported separately into A2X for Shopify. Typically you will need to define a clearing account for each one, and post the corresponding payment proceeds to the same clearing account. The exact configuration for these accounts will differ depending on the payment methods. You can enable, configure and preview these settlements in Settings > Connections. For more information about these mappings or if you have specific requirements that are not handled by the current mapping, please contact the A2X support team. Once you have connected, and configured your account, you can send your payouts to your accounting system. To do that, click the Send link. You will see the payout in your accounting system and be able to match or reconcile it to the corresponding deposit. 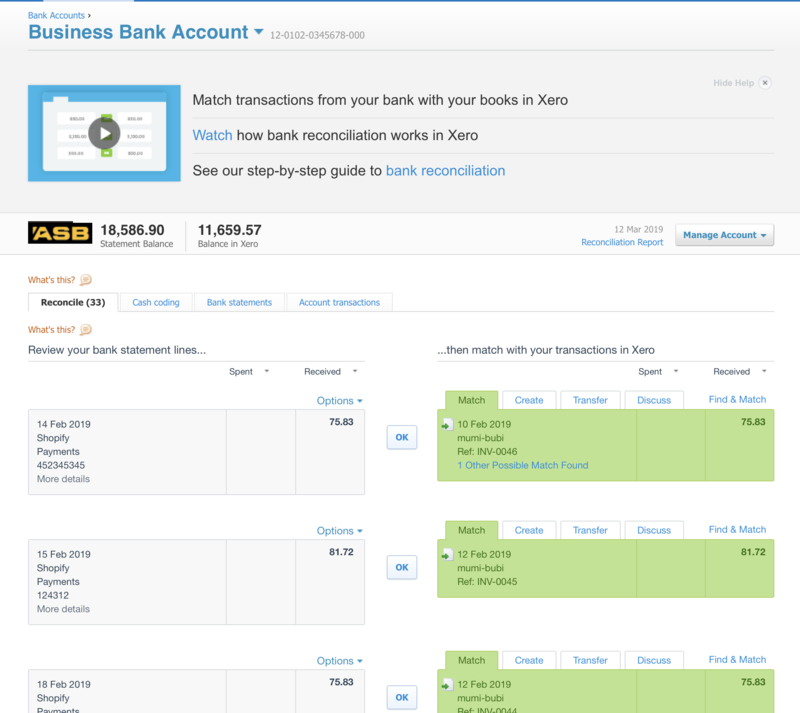 For example here is Xero's bank reconciliation screen showing the matching payouts.